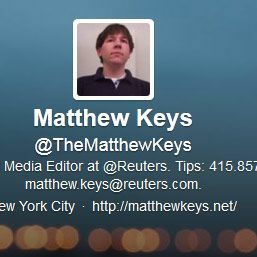 Matthew Keys, the deputy social media editor at Reuters and a relentless TIME-recognized Twitter machine, was indicted today for allegedly conspiring with the hackers in Anonymous to take over the Los Angeles Times website when he worked for the paper’s parent Tribune Company in 2010, the Department of Justice announced. The 26-year-old was then a producer for a Fox affiliate in California, but has since gone on to build his name as a journalist online, collecting more than 23,000 followers, many of whom are quite shocked (and exhilarated) by the news he might have committed a crime. Sabu, a.k.a. Hector Xavier Monsegur, was due for sentencing last month but had his hearing postponed because he was still cooperating with authorities. Keys foreshadowed work troubles in a Gchat with a friend last night, but was tweeting, as he does, right up until the indictment was announced. Update, 8:20 p.m.: Keys responded to the indictment on Twitter. Keys did not immediately return a request for comment. Keys faces a maximum of 25 years in prison and $750,000 in fines for all three counts.